Each of the new models delivers a stunning 450 horsepower. That's 30 more than the current Carrera S model and 20 more horses that the previous naturally aspirated GTS models. Refreshingly, each of the GTS models allows you to row your own gear as standard and PDK comes as an option. Along with those 450 horses comes 405 lb.-ft. of torque. For those of you interested, that's 37 lb.-ft. more than the Carrera S. All that torque becomes available between 2150 and 5000 RPMs. PASM, or Porsche Active Suspension Management, is standard on all models and the GTS coupe version come equipped with the PASM sport suspension that drops the ride height nearly a full half inch (.39 inches). Zero to 60 is .2 seconds faster in a GTS coupe as compare to a Carrera S or 4S. If you opt for PDK you'll get there even faster at 3.4 seconds. All said and done, the top track speed is of the various models is as much as 3 mph higher, depending on variant, than their non GTS brethren. That means the 911 GTS coupe, equipped with a manual transmission, can hit 193 MPH. That's pretty damn impressive. All GTS variants are based on the Carrera 4/4S body, which measures an astounding 72.9 inches wide. The front end features a spoiler lip painted in black. 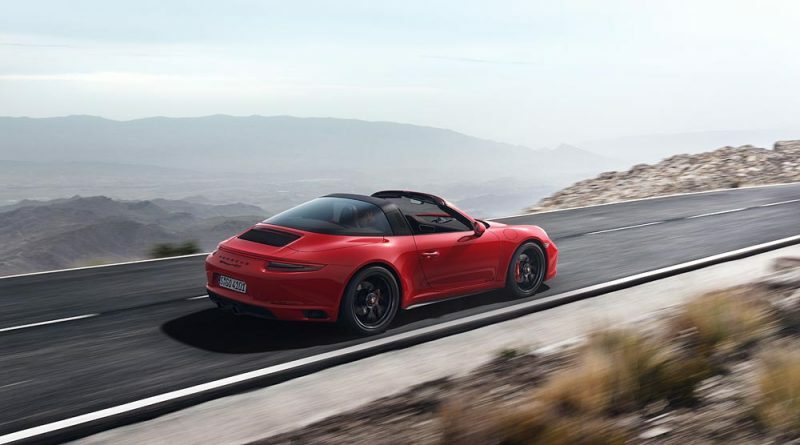 While the rear spoiler extends even higher than the normal Carrera model to reduce lift on the front and rear axle. Also as standard are tinted tail lights, rear lid grill strips with a satin black finish and tailpipes in high-gloss black (a feature of f the standard Sport Exhaust system). A new black trim strip between the tail lights is featured on the rear-wheel-drive variants. A light strip between the tail lights is reserved for the all-wheel-drive models. Sport Design exterior mirrors, 20-inch center lock wheels painted in satin black, and black GTS logos on the doors represent further visual characteristics. The Targa bar, on the Targa 4 GTS, is black with a satin finish for the first time. In case your forget what you're dirving, the GTS versions come standard with Sport Seats Plus with the GTS logo on the headrests. More interestingly, the stopwatch of the standard Sport Chrono Package is integrated as a central component of the dashboard. This is due to the Porsche Track Precision App which includes automatic recording as well as a detailed display and analysis of your driving data on a compatible smart phone. Interiors are trimmed in a combination of leather and Alcantara® that is highlighted with a new seat stitching. Alcantara® can also be found on the standard GT Sport steering wheel, the gear lever and the armrest. The brushed aluminum interior trim is anodized with a black finish. I think the GTS is close to being the perfect 911 daily driver if you’re approaching your twilight years, or, enjoying being formally dressed up for all your driving occasions. For those of us who enjoy jeans, T-shirt, sneakers and cap, how about a harder edged version that ditches the sofa chairs. Perfect would be an optional RS clubsport interior, 20/25mm lowered suspension, 911R wheels, anniversary style chin spoiler, 1 inch taller rear spoiler lip, a higher rear bumper apron with removable and/or meshed exhaust shield. Additional spoils would be the light weight indented roof, larger rear engine vents, rear under body diffuser and perspex windows. That would ‘Sports Car’ the GTS and should reduce bipolar disorder. Thank you to Porsche for now updating the website options features for the GTS by including Sports bucket seats. I am alarmed as to why or how this could not be have been so from the very beginning. Well done.